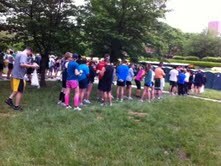 The is the front of the line where the 4 minute milers are positioned. Yes! That read 4 minute milers! Lol! I ran! I conquered! At least that’s how I feel. Lol! After a much-needed warm and bubbly bath, my feet are propped up on the sofa. My son is hypnotized by his Nintendo 3DS game, while my hubby and my daughter are getting their sleep on. I thought I’d be sleep, but I’m not sleepy… yet.Truly blessed is how I feel. After getting about 4 ½ hours of sleep, my hubby, daughter and son got up at 5:00 a.m. today to go with me one hour away to Philadelphia for the run. I was dropped off near the start of the run and they set off to park and to coax our son on to take part in the kids events. He did not participate. It was probably too early for him. What I love most about running events is that there is an abundance of comradely. Runners of all age, gender, ethnicity, race, religion, social status, income, and physical ability all come out. Most are supportive and encouraging. Along the course, I saw a young mom pause from running to bottle feed her baby in a jogger’s stroller. Not even an infant prevented her from partaking in the annual run. If she can do this, surely anyone can. A healthy life style is a conscious decision. 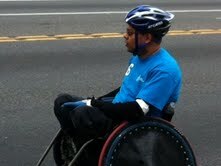 Confinement to a wheel chair hasn’t stopped this participant! You choose to participate. Runners of all shapes sizes and ability run the course. The time on the official clock is of no importance to the average runner. What ultimately matters about time is that living a healthy lifestyle may add to one’s life. I said, “may.” I know that only life and death are guaranteed. Mom loathes when I speak of a healthy lifestyle. She is quick to name those who ate well, never smoked, and exercised yet died from cancer or another terminal illness. I also point out the data that supports the principles of maintaining a fit régime, but it doesn’t matter. I believe that to change our perspective we must be open to new ideas. If we’re not open to new viewpoints, then no amount of data or persuasion can adjust a person’s thinking. I accept that and stop trying to convince her to take better care of herself. She believes that at 78 no one can change. That is her truth, which I now respect. Most runners set personal goals. Perhaps complete the race because it is their first run. Possibly run the entire event versus a walk-run. I try to improve my time but regardless, I am overjoyed at completing another organized running event and wish that I could bottle the feeling for other days that are more challenging. What’s next? I don’t know, but more running for sure. I also want complete a mud run and a triathlon. Don’t they sound like fun? Lol! 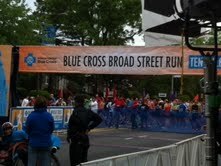 Here are more pictures from the Broad Street Run. Okay so if you are incredibly fast, you do receive special treatment. No!! I am not nor have I ever been considered an “élite runner!” Behind the sign was a tent that looked like it had food and beverages…most importantly, a bathroom that did not have a long line. Lol! I am standing in the grey corral waiting for the race to start. There are just as man runners in line behind me. It took my group nearly 20 minutes to get to the official start line. I felt a little like herded cattle. 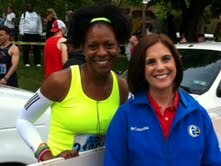 Me and Amy Buckman posing at the front of the runner’s line. I also wanted to take a picture with CecilyTynan, but I think she was hiding from me. One of my friends probably told her that I was looking for her. Six ABC News is my favorite news station. I picked up my race packet on Friday. This is near the beginning of the line! The line moved quickly though. If you haven’t participated in a run or run/walk event, I suggest that you give it a try. You will love the feel of accomplishment when you complete the event. Although I feel short of my goal, I finished the run and I am happy! This is me before the run. I dressed really bright so that my family could easily spot me. This entry was posted in Family Living, Fitness, Inspiration, Uncategorized and tagged 6abc, Broad Street Run, CBS, Clubs, Health, healthy-living, personal goals, Philadelphia, Races, running, Sports. Bookmark the permalink. This is so awesome, Tanya!!!! It is informative and funny!!! I must share this on twitter and fb!!! !